Bowling leagues are open to players of all abilities. Our handicap system gives all players and teams a better chance - the bowling handicap is explained below. The bowling leagues are operated by the bowling club; KBowl Tigers. For information about the club click here. There are teams of maximum 5 people from which 3 people must play a match each week. So it’s a squad so to speak. Having a squad of 5 takes pressure off players to be available each week. Depending on the number of teams, the competition usually lasts for 8-10 weeks with each team playing against each other in a league format. The matches take place on a Tuesday however if a team cannot make it then another date can be fixed. "Eddie, who is in a league of his own"
Bowling is classed as a sport especially in the USA and some players have been known to take leagues seriously with strict training regimes and high protein diets….. However this is completely optional. As you will see from the players in KBowl we prefer to rely on natural ability apart from our friend Eddie, who is in a league of his own when it comes to preparation and dedication! The handicap system ensures all the matches can be competitive so experienced bowlers can play against beginners with the latter having a chance of winning. Each player is allocated a handicap based on their ability which is assessed over a few games. The handicap is added to the number of pins a player knocks. This will bring their score up. Players start with a handicap of 72. So for example if a player has a handicap of 72 and s/he knocks over 100 pins then their score for that game is 172. 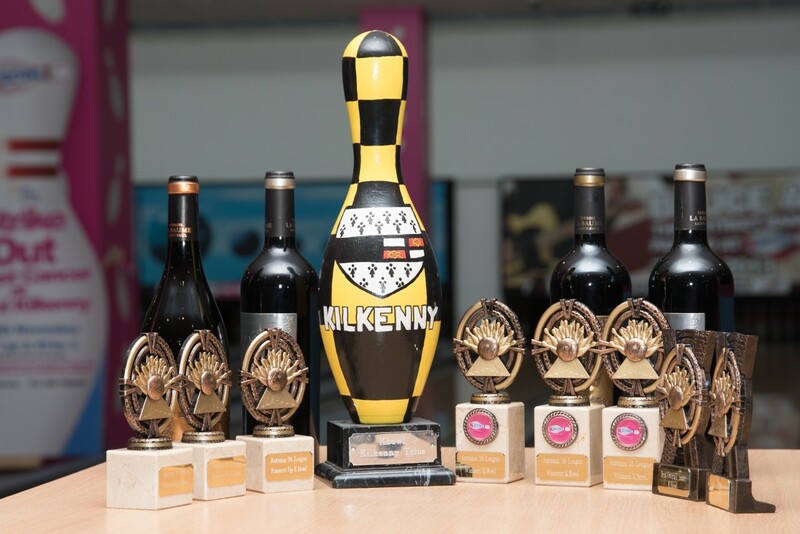 The final round of the Kilkenny ten pin bowling winter league took place on Tuesday 6th January. The tension was palpable as it came down to the final game on the final night with the 200’s just edging out the A Team by a handful of pins. The Comerford brothers Shane and Niall along with Mark Collins formed the winning team. Highest single game score Shane Comerford with 224 pins knocked. Highest two game score was John Ryan with 370 pins knocked. Highest average score Stephen Brennan with 162. If you have any questions about taking part in our league please fill out the contact for below. If you prefer to contact us by phone 056-7788200 or message us on facebook.